Have you ever strolled down the pet food isle and wondered “why is there a refrigerated case here?” I know I’ve wondered that. Have you ever peeked inside the case and mumbled to yourself “I am not gonna put dog food in my refrigerator next to my food?” Who on earth would buy dog food that needs to be refrigerated and who would pay that price for such a small bag? These are questions I asked myself as I stood in front of the Freshpet case in the dog food isle at Wal*Mart. Yes, I shop at Wal*Mart, but that is besides the point. I am a mom to a muppet like dog and I want what is best for him. His heath and life are very important to me. I buy him the best and settle for nothing less. I mean I drove around for hours on end during the big power outage last summer just so my little guy could have air conditioning and hang his head out the window. My dog literally almost goes every where I go. My family treats him like he is a child, my Mama tells people “my grandson has four legs and a tail.’ It’s true Cullen has a tail and four very fury legs. 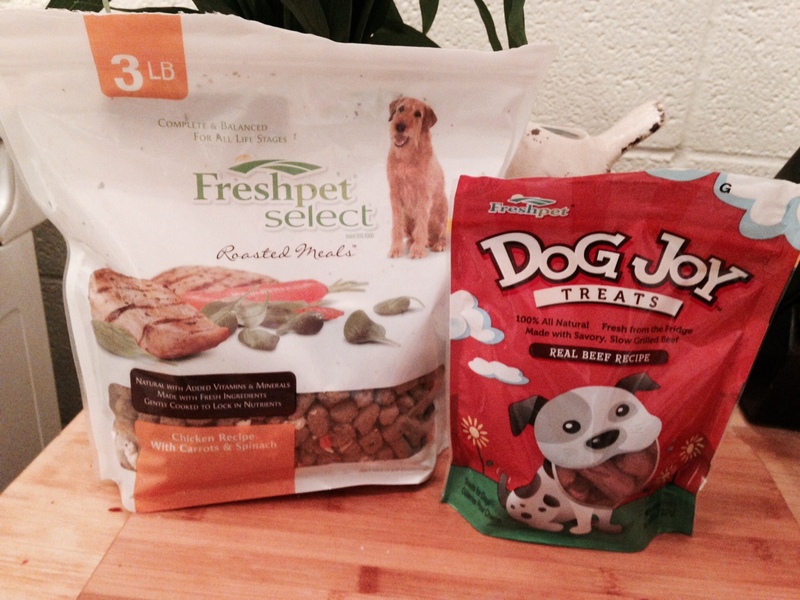 With dog treats on my list I headed down the isle and started to Google Freshpet. I liked what I was reading and started to see the light, that fresh truly was better. Freshpet is packed with vitamins and proteins. Freshpet meals offer fresh meats, poultry, and vegetables that are from local farms. The Freshpet team gently cooks the meals at lower temperatures, so vital nutrients that go into Freshpet foods actually stay in. As a result, Freshpet is 1/3 less processed than leading dry foods. That’s a winning recipe for pets everywhere. Cullen has been eating fresh pet since July and I cannot begin to describe the difference it has made in his life. The muppet’s fur is shinny, he has more energy, his eyes are brighter and he can’t get enough of Freshpet in his bowl. Its kind of funny when Cullen is hungry he will go and sit in front of the fridge and look up at me with his big brown eyes. He gets so excited when the door opens, he practically eats the food right out of the scoop, and the same goes for the treats. Feeding time has become very entertaining as the muppet like dog gets so excited for Freshpet. “What Freshpet Products does Cullen like best?” Oh, I am so glad you asked! Let’s find out! Freshpet Dog Joy Beef Treats: these bite sized treats are made in he USA from all natural beef that is slow cooked to perfection for that BBQ smell. ———————> The muppet like dog loves these things! I finally have him weaned from his beloved Pupperonis and Dog Joy Beef treats have taken there place. Freshpet Select Roasted Meals With Carrots & Spinach: Made of tender pieces of fresh chicken accented with carrots and spinach. ——————-> The muppet like dog gives Frespet Select Roasted meals four paws. He cannot get enough of this food. When I was feeding him dry dog food it would take him a week to eat a bowl full of food. It would break my heart to always see a full bowl of food. I would often have to throw it away for fear that it had gone stale or something. I no longer have that problem, he literally licks his bowl clean at mealtimes. Freshpet has a great line of products for all of your dog’s and cat’s nutritional needs. Freshpet has a great website with all of the information and reviews that you need to become a believer. To find out more about Freshpet please head on over to http://m.freshpet.com to find out if Freshpet is right for your four legged friend.